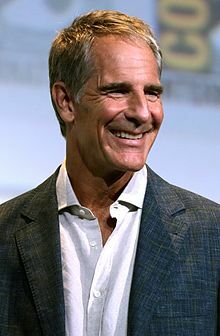 اسکات باکولا (اینگیلیسجه: Scott Bakula) آمریکالی فیلم یؤنئتمنی و اوْیونچو. آمریکادا دۆنیایا گؤز آچیب. 1986–گۆنوموز ایللر آراسیندا سینما ساحه‌سینده چالیشیب. 1986 Walt Disney's Wonderful World of Color Jeffrey Wilder Episode: "I-Man"
My Sister Sam Peter Strickland Episode: "Teacher's Pet"
1987 CBS Summer Playhouse Dr. Sanderson Episode: "Infiltrator"
2007 American Body Shop Maury Episode: "Juicy Lou's"
2008 Boston Legal Jack Ross Episode: "Glow in the Dark"
Law & Order: Special Victims Unit Kent Webster Episode: "Vanity's Bonfire"
Family Guy Himself Episode: "Burning Down the Bayit"
Two and a Half Men Jerry Episode: "Bazinga! That's From a TV Show"
2016 Brothers Take New Orleans Himself Episode: "Welcome to the Big City"
2017 It's Always Sunny in Philadelphia Himself Episode: "The Gang Turns Black"
اینگیلیسجه ویکی‌پدیاسی‌نین ایشلدنلری طرفیندن یارانمیش«Scott Bakula»، مقاله‌سیندن گؤتورولوبدور. ( ۲۲ ژانویه ۲۰۱۸ تاریخینده یوْخلانیلیبدیر). قارداش پروژه‌لرده اسکات باکولا گؤره داها آرتیق بیلگی‌لر تاپابیلرسینیز.